Fresh Air for Fresh minds equals Fresh insights! Judy Francis Based in Gloucestershire, Judy’s mosaics are inspired by Gaudi’s flamboyant buildings in Barcelona and Tiffany’s stained glass collection. She taught art at Hatherop Primary School for many years before studying with local mosaic artists, Erica Bibbings and Anya Burzec. Her work is now eagerly sought for its colourful and vibrant evocations of bird-life and her more abstract panels. Her lovely rooster and dragon fly are lovely pieces and I can only gasp in awe as I saw them at this wonderful exhibition. More recently another creative workshop participant Lisa Brind was kind enough to introduce me to Horsely School near Stroud. This project will be the conversation for another day detailing the joy and happiness working with the school’s lovely children, teachers and parents! As I look back at all these pictures I’m inspired to work with new participants at my next creative workshop on the 3rd of August 2013 in Poole Keynes. If you are on a social platform add me on Facebook or Google+ and you can book the event directly from the event calendars! Have a wonderful weekend everybody and if you can please check out Fresh Air 2013 before July 7th! It is indeed a refreshing sight! New Dates for Good Mates! Check Mate for old Dates! First of all the boring bits to excite those interested in my next Creative workshop! Special and reasonable price on application with plenty of beautiful and new materials to use! Details will be e-mailed when you use the contact form below! Cirencester, Gloucestershire, – only 25 minutes from Swindon. Please check these links for recent previous work-shops to see the wonderful creations you have put together! Materials, snacks and drinks are included in the price ! This is a therapeutic and addictive workshop, which will leave you wanting to do more in response to your current requests. Just as a reminder if you are unable to attend this course you are more than welcome to request for other dates. I am willing to organize 2 day or one day courses when we have a minimum of three participants. Now with the workshop announcement over its time for the fun stuff that I have been meaning to put together for a while but too many things got in the way! My visit to the Contemporary Art Fair on the 8th of July was truly special! This year it was crammed with desirable fashion accessories and functional and decorative objects for your home and superb mosaics! But most importantly it gave me an opportunity to connect with Cleo Mussi my favourite and the established Mosaic Artist you know again. As Cleo Mussi once said and laughed, ‘I’ve no idea how to describe what I do.’ ‘It’s difficult… if I say I make mosaic, people have images of all sorts of hideous things, but if I say I deconstruct and reconstruct ceramics, that’s a bit pompous. I usually end up just showing people my work.’ Cleo is a joy to be with, very humble and kind and a true inspiration for anybody in this profession. Cleo thanks for inspiring me to do what I do! I can proudly say that you are partly to blame for me making and teaching mosaics! This special day would not have been possible without Angela Ibbs another excellent mosaic artist sending me the tickets. Excellent visit as you will see from the sunshine and what more required to enjoy a superb day in the Bovey Tracey. It is a small pretty and quaint market town, built of cob and granite and known as ‘The Gateway to Dartmoor’. It is also home to the Devon Guild which is a great place to visit and has some more Cleo Mussi exhibits! The day dusked but not without my good fortune of falling in love with King Kong. The beautiful festival and the sweet town of Bovey Tracey is well worth a great visit next year or any other opportunity! Till then for me its back to mosaics and the happy little treats that life proposes. Have a great day! Ciao my lovely blog followers! Pictures speak a thousand words they say and beauty can only be appreciated by creations so I leave you to be the judge of the finished works that we produced here this June start in the Poole Keynes village hall. 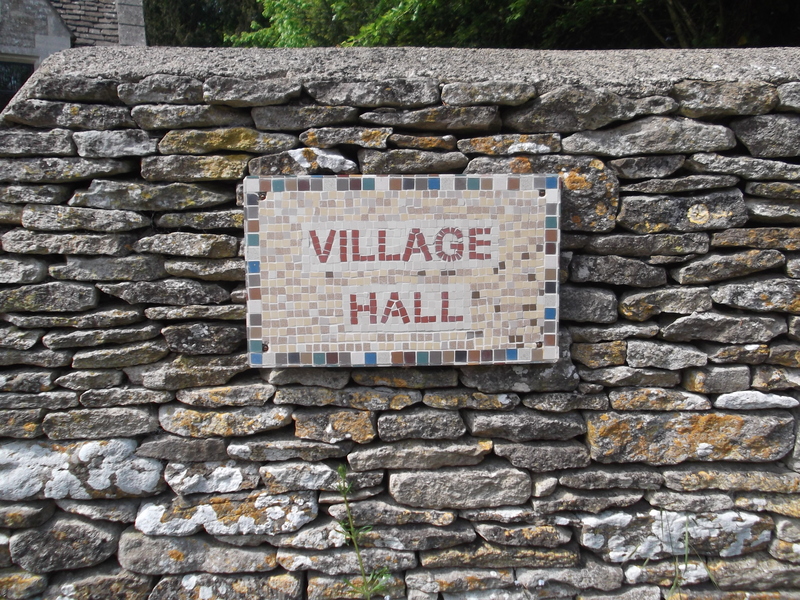 I would like to proudly point out that the village hall sign was previously made by local Judy who has a passion for the village hall and this shows in her work. This workshop was more intense and almost a master course as the attendees were all charged up to produce creations that they could display proudly in their settings. We had a special visitor for the second day as the troops carried on gallantly and young Daniel was very inspired to join the lovely ladies as they completed their beautiful creations. As usual the proud finish with the completed works. One of the mosaics will be installed in the wall with adequate arrangements made for the placement of a fountain through the same. This will add a real highlight to the garden. The other mosaics will also be beautiful when mounted and I will have more pictures when the same is mounted and grouted. At last it was time to pack and go and leave the mountains of materials alone. I have no doubt that they will indeed inspire a lot more creations. 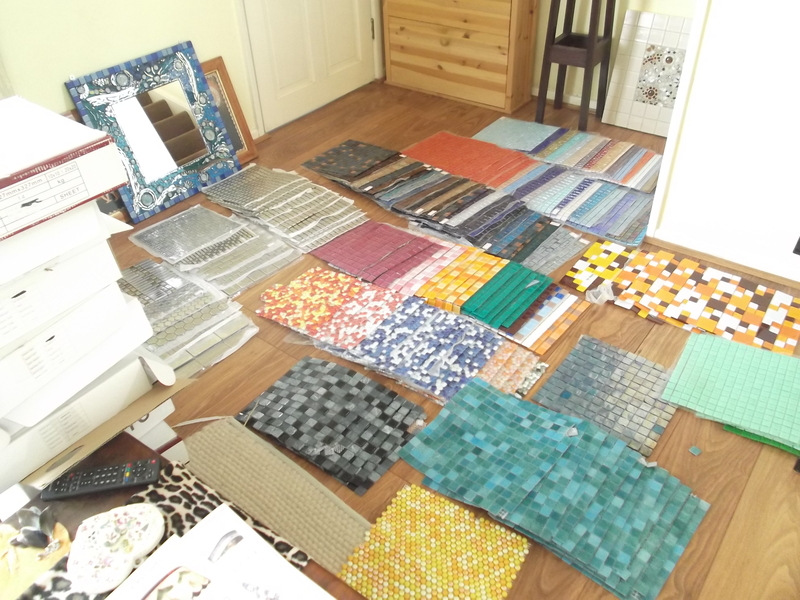 I have started sourcing really beautiful and expensive materials for my courses and my lovely artists agreed that they had a wonderful time out and the course was the best value for money deal that they received. I am proud of their creations and look forward to leaving a mark and having happy memories in many more homes. The next course might be at the end of June or sometime in July. If you are interested in joining please send me feedback as well as indicate the rough dates when it might work for you. Thanks Monica, Yate heritage centre and all the people that liked my competiton entry on the Hobby Island page. Likes are only counted on his page so if you loved Orlith on my page I would be greatful if you like the correct link and as if I win I will donate the materials for the next community mosaic. Please also visit my facebook page and like it. Have a wonderful summer and catch you soon in the sunshine. Great day out with 30 plus children in two shifts plus plenty of mummies, daddies carers etc. It was so sweet to see all the tots big and small and even some of the adults joining in to have some fun and show their creative talent of merging colours and jigsaws that they pieced together in their minds. The popular shapes were of course the dinosaurs and some of the children knew even what type of dinosaur they were though I must confess I already forgot. How impressive. Time for me to go back to school but I think I need to get a new memory card as mine has got out of storage. I can’t compete with these six and seven year old children any more and of course some of you might appear in the local paper. I will send you details of the link soon. If you had a great day out please visit https://www.facebook.com/events/158424784336932/ for details on the next event this Saturday. Details also posted on an earlier post in my blog. Feel free to like my page at https://www.facebook.com/pages/Anya-Mosaics-and-Soul/455752447804264?ref=tn_tnmn Thanks Monique for your feedback that you kids had a great day out. I hope more people would write some feedback and ideas as that would allow me to do more things with the local community as well as schools in your area. Was lovely to meet all of you and thanks again for all the effort for a wonderful workshop in Yate as always. Don’t forget to check out the Gazette next week and if you are spotted please give me a shout to share your fame. Finally don’t forget to like Orlith my dragon. She has been entered to win the mosaic of the month competition at Hobby Islands. If I win I will be using the money towards materials for the next community workshop so that you have have even more brighter colors and goodies for your next community workshop. Orlith the dragon has re-emerged to breathe fire and ignite the summer. If you like my creation please hit like and she will smile and the sun might blush to make sure summer is beautiful. See you soon. Only £ 75 for both days! All materials, snacks and drinks are included in the price – only £ 75 for 2 days! We will create exciting mosaics on wood, mesh and other objects. 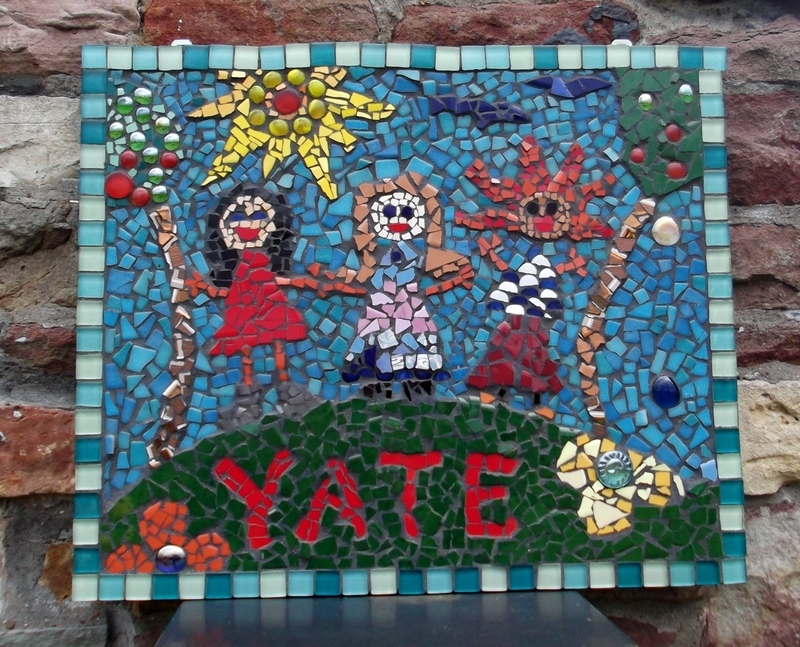 For my friends who are on a mosaic course (18,19 May) it will be second part ( and only £65 for them). We can finish mosaics or/on start new ones. I was very quiet for last years and come back to life again! Please contact me for more details and to enroll. 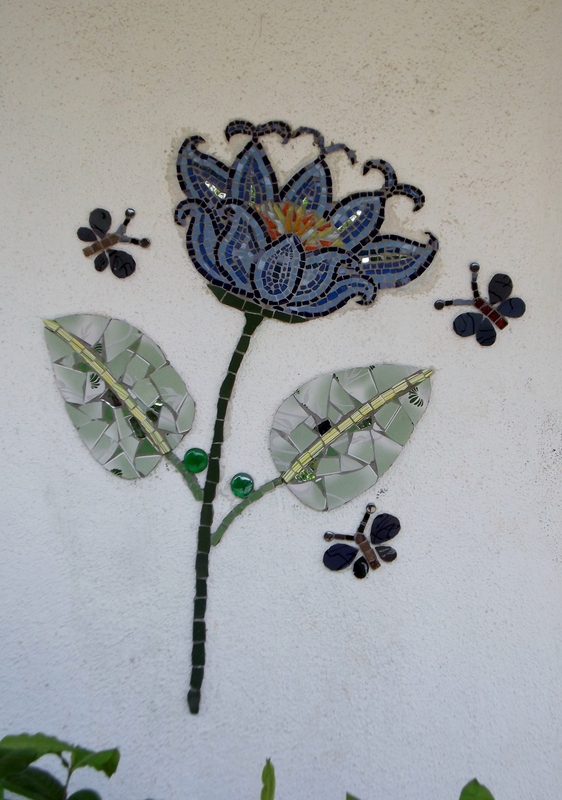 You can check previous courses and what amazing mosaics students created : just look at the mosaic workshop.